Gary comes from a musical family and is the 4th generation of his family of performers, teachers, and band leaders. 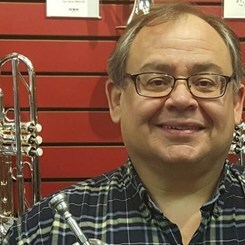 At age eight, Gary started music lessons with his grandfather, who founded many volunteer fire department and community concert bands across Western N.Y. State. As a child, Gary performed with many different bands his grandfather founded and his father continued to lead. Broadening his musical experience, Gary performed in high school and college marching, concert and jazz bands as lead/solo trumpet. Over the years, Gary has studied privately with accomplished Community musicians, in addition to, Eastman School of Music and Ithaca College Faculty. Gary holds three (3) college degrees- Associate, Bachelor and Master. After college and over the years, Gary has performed with groups in the jazz idiom like; Brass Menagerie Big Band, Rochester Metro Jazz Orchestra and the Smugtown Stompers Dixieland Jazz Band. Other types of groups Gary has performed with include Pop/Rock groups like; “Solid Gold” and Vegas-styled show bands. Additionally, Gary is invited to play with pit orchestras of local community theatre guild productions of Broadway musicals. Furthermore, Gary is often contacted by many different types of musical groups to be a substitute musician. Gary is also a member, instructor and mentor in the All-In Brass Band (a RAPA Community Project). Other than trumpet, Gary plays the euphonium (baritone) with the LeRoy and Irondequoit Town Concert Bands. Since 2010, Gary has taught at Music & Arts having students in elementary, middle, high school, as well as, adult learners. Gary’s students learn applied music theory, fundamental mechanics and techniques, solo and audition preparation, best practices and useful tips that Schools often don’t explore. Most of all, Gary makes sure that his students are having fun at every lesson!